Okay, seriously you guys…there just aren’t enough great things to say about Lindsay Buroker’s books. So far, this was probably one of my favorites in the entire series. SPOILER ALERTS! In the previous book, Deadly Games, Emperor Sespian Sevarsin requests that Amaranthe’s team kidnap him. 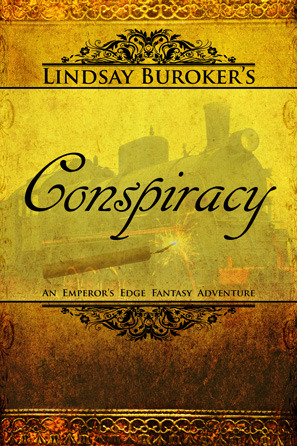 Conspiracy opens on a dangerous train exercise in which her crew tries to practice their kidnapping-the-emperor-from-a-locomotive technique. This entire novel was non-stop action and excitement. There was never a down-moment or a chance to relax. This book definitely kept me on my toes while I watched Amaranthe, Sicarius, Books, Akstyr, Basilard, Maldynado, and Sgt. Yara perform their rolls in the kidnapping caper. I was honestly shocked by just how much there was at stake in this story line. At any moment, I thought someone might die, get flung from the train, or that the plan would simply fail. Buroker is quite talented at keeping the reader in suspense and in anticipation for the next scene. As well, the cliff-hanger ending was an agonizingly awesome touch! I immediately purchased the next book Blood and Betrayal and dove in. Do yourself a favor and go read the Emperor’s Edge books. RIGHT NOW. You have no excuse. The first book in the series, The Emperor’s Edge, is free for the Kindle, Nook, and other reading devices. Simply look it up on Amazon, Barnes and Noble, or Smashwords and you’ll find it. You won’t regret it, I promise.